Sharing my experiences in an honest humorous do's and don'ts way after being involved in many levels of cycling in Colorado. Never be intimidated by any mountain climb in Colorado. Even if you go so slow you feel you will fall over, and even if you stop several times, you will make it to the top if you have it in your mind to succeed. The ride to the mountaintop is not about the journey (although it is about the scenery), or how many people pass you or do not, it is about the destination. You must believe deeply to get yourself to the top. Do try to find 2-3 people to ride with whom encourage you, are dependable, make you laugh and at the end of the ride leave you feeling better in spirit; better in body is not a guarantee and is about as reliable as a consistent game of golf. Some days you will ride better than them, some days they will ride better than you, but together you will be stronger. You will know you have a mate who will be there for you in sickness and health, and in "Ha, I beat you to the city limit sign!" Never trust or get involved in a conversation (rant) on Twitter with anyone who is antagonistic or eager to beat you down. Also never read the comments on 303Cycling.com, some people are just plain angry or mean. Be discreet and communicate directly with anyone you have an issue with in the cycling community. Tensions sometimes run high. Everyone makes mistakes and this community is too small to make enemies. Do remember those who brought you to this point. Once you have ridden a bike next to someone, you have made a friend. I might not see all the people I used to ride with, but I always wish them well as years go by. When you experience the pavement rolling by under your wheel and ride side by side with someone whether in conversation or in quiet, or follow their wheel over the hill and dale, there is a bond built forever. I have only ever felt this kind of bond in sport in big wall rock climbing or back country skiing. I have learned so much from so many. Never take your bike into a bike shop unwashed and ask for a "tune-up." Do ask the mechanic questions about your bike every time they make or plan a repair. You will learn exponentially; there is always more to learn. Maintenance of your bike is a responsibility of ownership. Do learn how to change a tire; the skill will afford you far more freedom. Do talk to anyone who has a bike in hand. Honestly, all barriers vanish. If you ride a bike, you have something in common. Whether he/she is 12-years old or 75-years old, the most decorated racer or the newbie rider - talk to them. Say hi, give an honest compliment, ask a question, listen to their story, leave with a smile. I am serious - there are some very cool people riding bikes around this state and you never know their story until you break that silence. Do understand that nutrition matters; weight of the bike less, bike handling is super important, and determination even more so. Try to learn not to be anxious and stressed out while riding, it takes away from your experience and your performance. Never wear your helmet pushed too far back on your forehead. I will tolerate almost any other clothing style errors but this one. Okay, maybe no long dangling earrings either. Do volunteer at races or events and please represent cyclists as law-abiding citizens. Enough said. Never go into a porta-potty (portable toilet) with your cycling gloves on. Enough said. Do find a bike that you love riding. Not a bike someone else has, or recommends for you, or thinks is top-of-the-line. Find a bike that makes you want to get out and ride. Never keep your chamois on for hours after your ride. Even if you do need to download your GPS ride data and Tweet or Facebook about your awesome speed and altitude gained. You have chamois priorities! Do buy the very best technical clothing you can afford. It will last you for years (if you keep it out of the dryer) and might just save your ride. Never neglect to return a wave or a hello while riding. Being rude has no place on this earth. Enough said. Do know that most storms pass, including those pesky afternoon rain showers in Colorado. I say wait it out and remount. This motto applies to most things in life. Do reach higher than you ever thought possible. It takes an idea, a step-by-step plan, an unwavering belief in yourself, passion and determination - but you can attain anything you put your heart and mind to in this sport. If you have ever said, "I have always wanted to...." or "Someday I want to...", then make it now. Start with the first big daring step and watch how the ball starts rolling. Never buy 3 full kits, plus jacket, vest and all the accessories of any team kit (unless they are free) because the team sponsors will change the next year, or somebody won't be happy with the leg elastic, and you are out considerable moolah. Do at some point, ride both inside, and more importantly outside, the county borders of Boulder, Colorado. Do know that you will evolve. You will roll with the times and changes as much as your bike will. You will grow faster and then slower. You will have triumphs and disappointments. But in the end you will have racked up some awesome experiences along the way. Do save some cool memorabilia from your cycling experiences. Not that we need more stuff, but memories are the right kind of stuff. Never build your entire identity around the bike. Everyone should be able to talk about at least 4 topics in depth. My dog counts as #2 of 4. Do plan weekend trips to ride in other areas of Colorado. Within a two to five hour car drive, a whole new world of riding possibilities open up. Get out and explore by car, by tent, by trailer, by hotel, by bike! What I do know for sure - and try hard to keep sight of - is that I would be more interested in sitting down to dinner with someone who described to me the view from the mountaintop than I would with someone who described to me the view from the podium. Over time, experiences had and connections made, count more. It is not about where you placed at the finish line but that you made it to the line. Unless, of course, you were first. Or you doped, denied it, won, got caught, said you were sorry, or didn't, and then made tons of money for the rest of your life in the industry you cheated and everyone seemed okay with that. I'm still not okay with that. I'm hoping those types pay at the golden gates. For the rest of you - you are invited to dinner! I bought my first road bike in 2001. The next weekend I rode from Boulder to Steamboat Springs, Colorado, over Trail Ridge Road in Rocky Mountain National Park. I had no idea what I was doing (but at least my helmet was straight), I simply believed I could do it. This was such a great group I rode with, I think of them fondly but haven't seen them in years. They inspired me and changed my life. 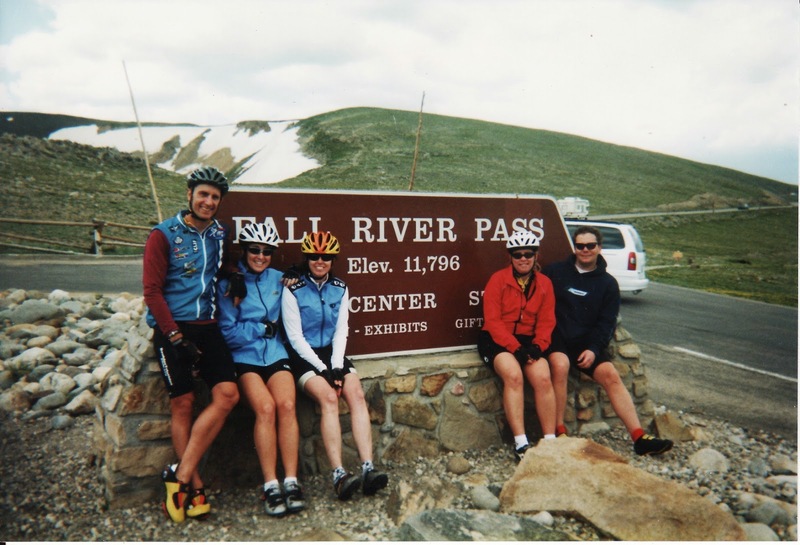 Our group of five who biked from Boulder to Steamboat in 2001 because Mike Ricci (left) planned the trip and thought it would be fun. I said "sure" probably because I didn't know any better. One thing is for sure - I should have kept that orange and yellow helmet.